For anyone who buys records in the North of England, Piccadilly Records is some sort of institution. The shop was born in 1978 and has sold many records ever since, with a selection ranging from pop and indie through disco, funk and balearic through electro, techno, ambient and many more. It is not uncommon that DJs pay it a visit whilst on tour, ask Todd Terje, Andras Fox, Len Leise or Basso, they’ll all be able to place it on a map. Patrick Ryder started working at the shop back in 2012 and is now the man in charge of all things disco related. If you go on the website and read a bonkers review of a record, there’s a good chance it was written by him. Patrick has also been penning sales notes for various labels such as Aficionado, Growing Bin Records, LYO, Good Plus, Olsen and more. In Manchester, he hosts a monthly balearic night at Soup Kitchen going by the name of Coastin’, has played in pretty much every single bar of the city, and of course he’s known for wearing shorts and sandals at any time of the year. 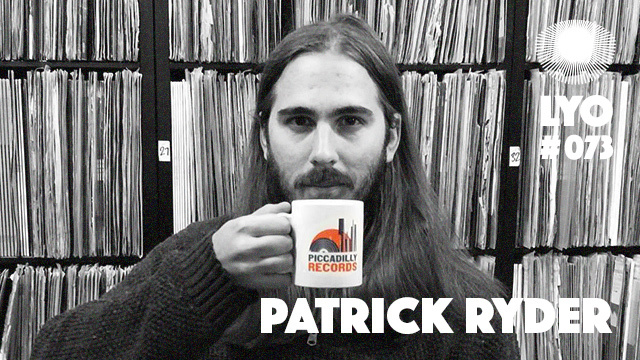 Should you want to know anything else about Patrick Ryder, just have a listen to this brilliant mix of afro, exotic disco, rare grooves and balearic stunners !